Doing what you love isn't abnormal. No matter how adamant the lazy ones are, I will keep calling to keep fit. The benefit derived from staying healthy keeps making me positive about fitness. I'm glad I've been able to follow my routine for keeping fit. Hello steemians, I'm glad to come once again with my ongoing actifit series. I talked about the actifit mobile features in the last episode. I explained how easy it is to use these features. There are some apps you will find difficult to use, but actifit is an exception. if you haven't. You will learn some things that would make you want to keep burning that calories. If you've taken your time to read the previous content, I'm grateful. One thing is to publish, and another is to attract readers. Today, I will be moving out of the actifit mobile app. Actifit to me has four levels. The first level is the Android mobile app, followed by the IOS. Then we now have the FITBIT and the Website as level 3 & 4 respectively. What I will be discussing is the Actifit.io landing page. Did you know that some actifitters have never visited the actifit website? Even me, I just visited it not quite long. Few weeks ago, I checked the website. I was surprised when I checked after a few days again and saw something new. Everything has changed. The site has improved with beautiful design and new features. There are still some other things we would be discussing in this episode. The ongoing competition and more. All these in a short moment. The login page is meant for those that are already on steemit. 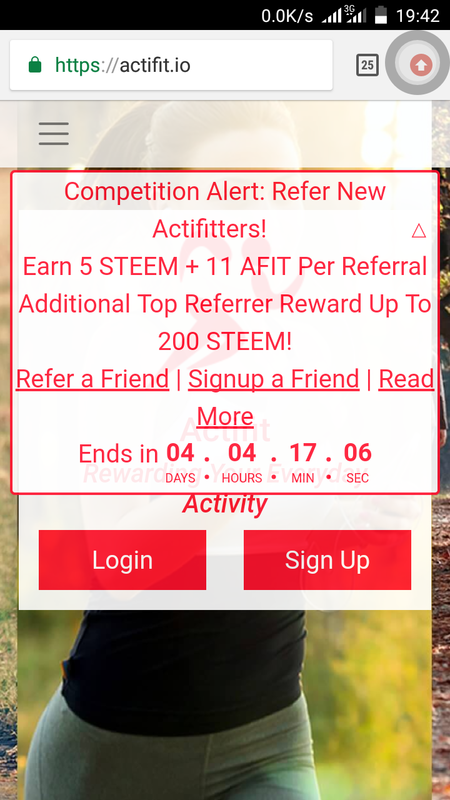 In other to log in to the actifit landing page, you will have to input your active key and user name when directed to steem connect. A successful login will redirect you to the landing page. The signup page will direct you to where you will create a steemit account. 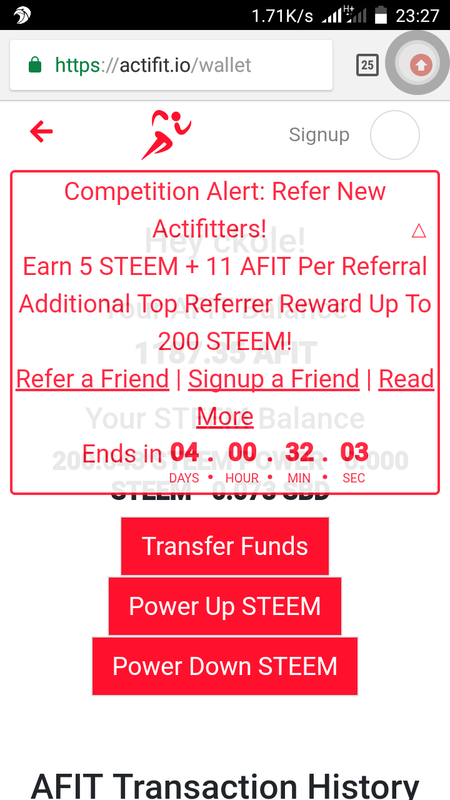 Good enough, you can create an instant account through actifit with just $10 equivalent of Steem. If you prefer a free account, you will wait for two weeks for your account to be verified. So far, Actifit has given out millions of token both to its contributors and delegators. As at when this content was compiled, Actifit had distributed 23,125,228 token. The number of token holders is also displayed and The reward activities read 51,396 This is to show the number of people that have contributed to the project one way or the other. Every project needs financial support. Without people coming together to contribute their quota, it becomes difficult for such a platform to progress. The growth of actifit was possible because of the impact of the delegators and contributors as well. Actifit shows some top delegators on the landing page for proper identification. A leader is always at the top. Actifit leader board displays the first three top actifitters. First three is always the point of focus everywhere. Even in schools, competitions, and so on. It encourages actifitters to try and merit the position. There are always players on the pitch to make a team. If the players aren't active, the team cannot progress. Actifit has a list of wonderful team that has been supporting the project. 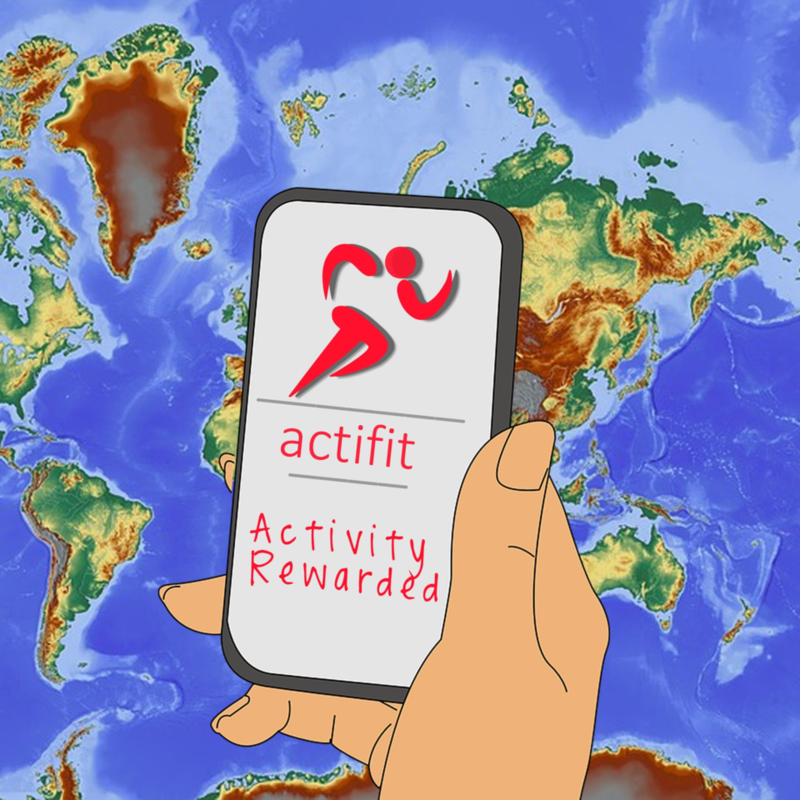 The experience, knowledge, and intelligence they've been using to drive the platform is part of the secret of actifits success. The list of these awesome people can be seen on the landing page. The actifit ambassadors are not left out. They are also part of the success. All of them are available on the page as well. The previous version of actifit.io also has my wallet. The difference now is the power up and power down features included. The wallet is now more advanced. Implementing these new features makes it more unique. The fund transfer and reward claim are the two features in the previous wallet. They are also wonderful. The fund transfer allows users to transfer their fund (Stem and SBD) from their wallet to another destination. The procedure isn't difficult. The user only needs to fill the available spaces. As in the amount of Steem or SBD to be transferred. Plus the recipient and the memo. This is another feature that can't be overlooked. Users can claim their pending reward anytime with the presence of this feature. I'm used to checking my wallet and doing some other things through Steem wallet. But with the implementation of this feature, the Landing page will serve as another option aside from steemit and some other few dapps with the same feature. This allows the user to increase their steem power. This is done by utilizing the available steem in their wallet. The steem would be used to power up by adding them to the initial SP in the wallet. On the other hand, the increase in SP would increase the vote given on each content upvoted. The power down that was added will allow users to gradually withdraw their steem from their SP. 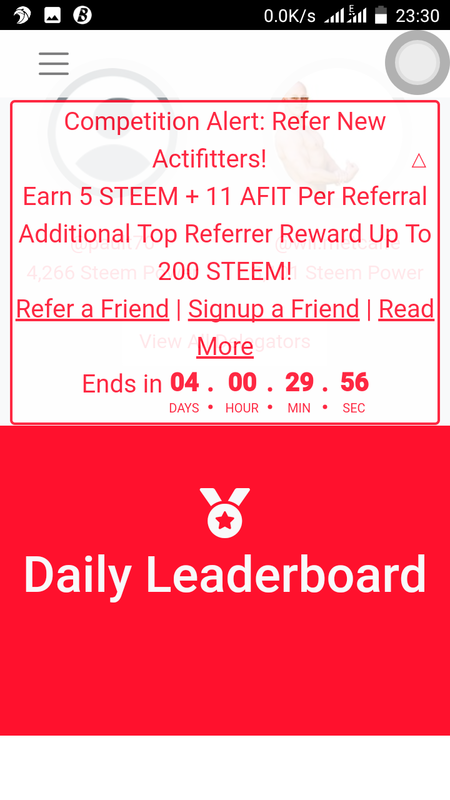 The steem power is designed in a way that it takes 13 weeks for all the Steem to drop. The whole SP would be automatically divided into 13 portions. Only one part will drop every week. That's why it takes 13 weeks for a whole SP to be completely powered down. There's an ongoing competition on actifit.io. It's simple. All you need to do is refer a new actifitter. 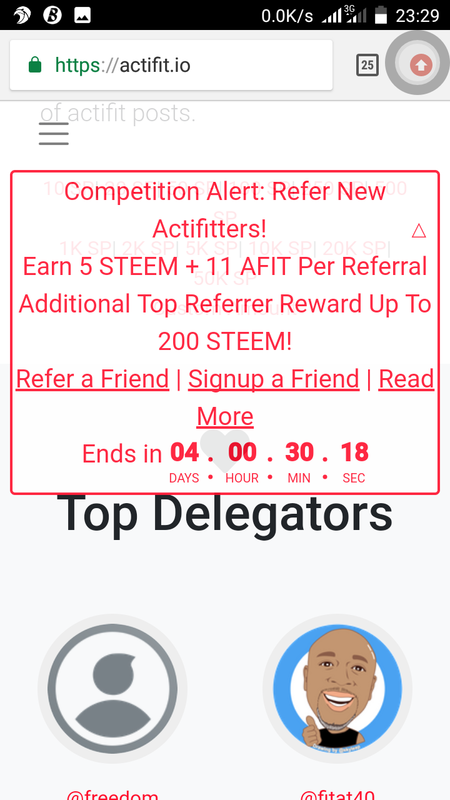 This will earn you 5 steem plus 13 afit token. 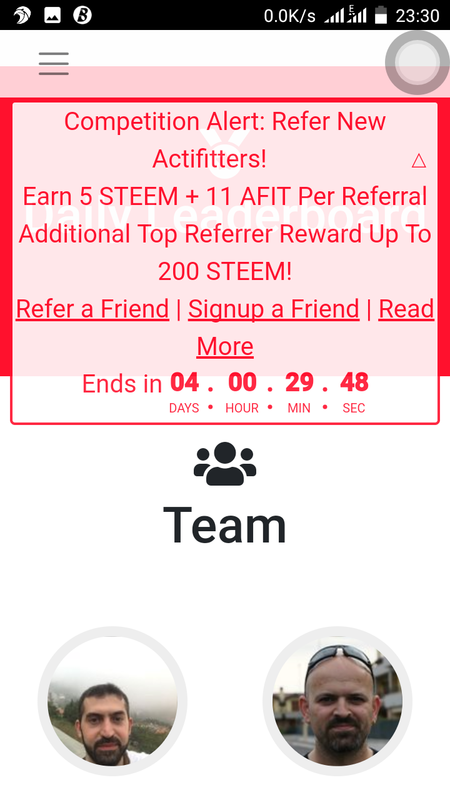 Refer 2 and get 10 steem and 26 afit token. If you are good at simple addition, do the math further. The more you refer, the higher the reward. There's already a countdown timer boldly engraved on the actifit.io website. 4 days left for the competition to be over. Less I forget, there would also be an addition 200 steem for the top referrer. That's cool. Refer a friend, sign up a friend and be a part of the progress. Be that as it may. The competition alert stock on the landing page isn't cool IMHO. It is mandatory for it to show up when the website is launched. Still, there should be a collapsing button to take it off the page for users to be able to freely do other things on the site. I only managed to click on my wallet after which I was unable to go further because of the alert. This shouldn't restrict the users' navigation on the website. I would love if this can be addressed within a short period for the competition to collapse. This only happens on the mobile device but normal on PC. Nevertheless, the IOS version is gradually coming up. The Android version in term of features is far from IOS. But with the frequent work done, there is a tendency that the IPS version will soon attain the same height as android version. Some features have been implemented. Only that it has not gone live yet. But soon, the concluded part would be released after its tested and trusted. Just last week, some professionals joined the platform. I'm not surprised to see such amazing thing. Actifit has moved beyond many peoples expectations. The way this platform is being driven is part of what has been making it stand out. I won't be surprised if the likes of Lionel Messi, Cr7, Novak Djokovic, Serena Williams and so on join the platform with huge support one day. Gradually it's beginning to happen. Let's ones again welcome the Badminton professionals into our midst. I was very happy when the announcement was made last week. Lasitha and Christine. Welcome to Actifit. If you haven't welcome them before please do. Lasitha and Christine are both professional badminton world ranked professionals, who play singles and doubles. Lasitha is the former #1 Men's single in Sri Lanka, with a world ranking of 112. Christine previously held world top 150 in world's women singles. Last year in the 2018 U.S. Adult Nationals, they placed 4th place in Mixed Doubles. Lasitha placed 3rd in men's singles. 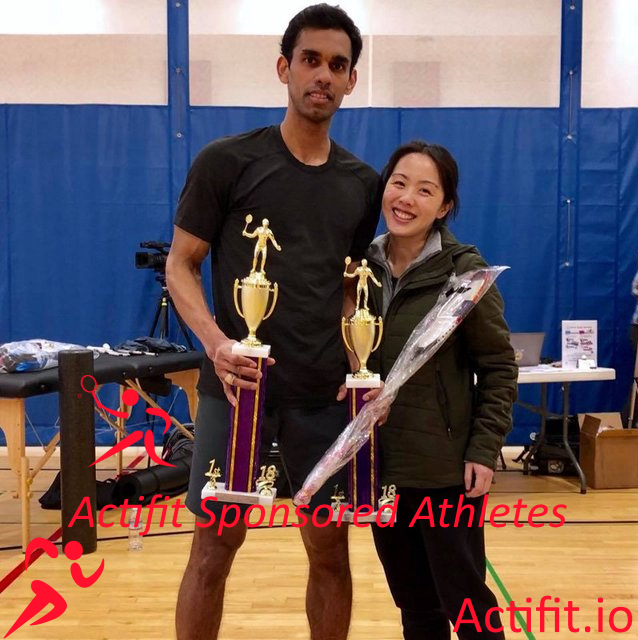 They have reached out to actifit, and we are happy to have them as part of our community, and to add them to our roster of sponsored athletes. On Steem, their usernames are @lasitha and @christinelook. Make sure to give them a follow and a warm Actifit welcome. The actifit.io website is full of goodies for you to explore. Apart from it been used as a marketing tool, it serves many purpose. The development taking place is all for users satisfaction. I'm moved with the way the platform is maintained. The competition is a unique strategy that would enhance the growth of the platform even more. It is good to take part in the game of fitness. Talk to people to stay fit with actifit. Save lives and receive a double blessing. This is @ckole (the laughing gas). Images from actifit blogs and some screen shot from my phone.